Quilting Patterns are a great way to get started on a new project without the worry that your design might not be balanced or look how you wanted it to. There are a number of different places to get quilting patterns, some of which are outlined below. Remember to check the size of the blocks/quilt before you buy as sometimes the quilt size can be smaller or larger than you planned! Making a baby quilt for a beautiful new arrival is such a lovely experience. Read on if you are looking to make something special for a new little bundle of joy. Christmas is one fo the best times of year, when all the family come around and parties are plentiful. There is nothing nicer during this time than enjoying a beautiful Christmas quilt, on the bed, over the back of the couch or even over your knee in front of a warm fire. Have you every wanted to make a real Amish quilt? 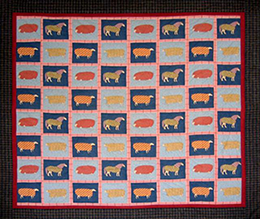 Read here for patterns, tips and general information on how to make your own authentic Amish quilt. Hawaiian quilts traditionally have strong meaning and cultures associated with each individual quilt. Learn how to make the many different types of Hawaiian quilts. Find a broad range of patchwork quilt patterns and designs including the log cabin, stars, flowers and all-American blocks. Scrap quilts are a fabulous way to clear out your fabric box and make a beautiful quilt from all of your old craps. They are inexpensive and often a lovely reminder of the quilts you have already made. Read here to find a number of beautiful appliqué patterns that will make your next quilt a joy to make. Whether you are a novice or expert, cathedral window quilts are simple to make. Have a look at how beautiful they are and see how an easy pattern can have a magical effect. Build up your quilting library with a variety of beautifully illustrated and well explained quilting pattern books. They are a great source of inspriation and creativity and are fantastic just to flick through and enjoy other quilters wonderful masterpieces.